Intra Steel offer a commercial kitchen design, manufacture and installation service which is competitively priced and individually tailored to suit you. Working with you through each step of the process we ensure your kitchen works for you and is completed on time and on budget. By manufacturing bespoke kitchen appliances, we are able to easily incorporate these sustainable catering appliances into commercial kitchen design producing innovative and energy efficient catering kitchens. From small kitchen design to large, we have built up a reputation of paying close attention to detail and aim to exceed the expectations of every customer. 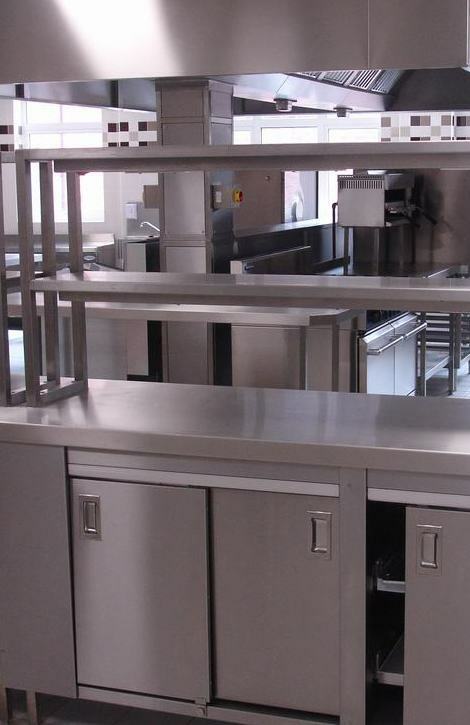 All our stainless steel catering fabrication, from a single stainless steel table to a complete commercial catering kitchen, is manufactured in house and quality checked prior to delivery and installation. Being an independent company we also supply equipment from all leading catering equipment manufacturers.